Barricades - Moyers Contracting, Inc. These are pictures of a recently completed job that had forty barricade panels. The ones shown are the Type A, which are sometimes called the three board barricades. We also do the Type B, which are the one board barricades. In this case, the barricades were used to create a barrier for an undeveloped cul-de-sac that leads to farm land. 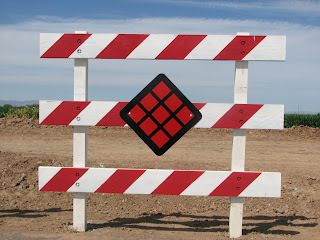 Barricades are used at the end of roadways to warn traffic that it is not a through street. Often times you will see the warning barricade where a driveway opening leads to future development. Our barricades are made per the MAG (Maricopa Association of Governments) specification. 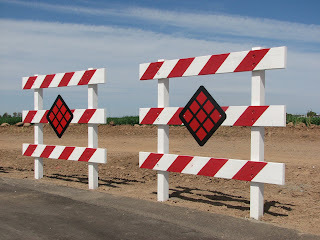 They are painted with reflective paint and have the diagonal red and white stripes. Be careful, some contractors will paint them without the reflective paint. Where each cross board attaches to the post, they have to have two lag bolts. Be careful, some will put just one. As you can see by the pictures below, these are straight and plumb. They are clean and spaced properly. 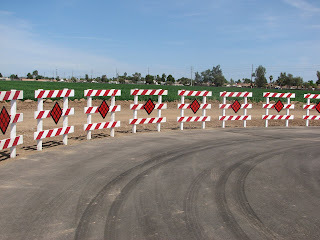 We have the experience to get your next safety barricade job done in the Greater Phoenix and surrounding areas. That includes Gilbert, Chandler, Scottsdale, Queen Creek, Tempe and all of Maricopa County. Moyers Contracting covers the entire State of Arizona. Give us a call and we will work hard for you.